The rainstorms that pounded Baltimore last week did more than soak a rain-weary region – city officials say they caused another 618,000 gallons of sewage to flow into the Jones Falls. At North Charles Street and West Lanvale Street, 42,500 gallons overflowed, DPW said. And from the outfall at West Garrison Avenue and Queensbury Road, 16,000 gallons infiltrated the sewer system. But the Friday overflow was dwarfed by the earlier gush from torrential rains on August 15 – when an estimated 570,000 gallons of sewage-saturated rainwater poured into the Jones Falls. At 428 East Preston Street, just east of the Jones Falls Expressway, 464,500 gallons was released. At the Charles and Lanvale streets outfall, 103,500 gallons overflowed. A “small overflow” occurred at 1901 Falls Road, the DPW release also noted. These overflows are part of an especially rainy – and therefore sewagey – summer, including 7.5 million gallons released on July 28-29. Federal officials sued the city years ago over the structured overflows, designed into the system to prevent sewage from backing up during heavy rains. They permit millions of gallons of raw sewage to flow into local waterways and, ultimately, Chesapeake Bay every year. After decades of poor upkeep, Baltimore’s sewer lines have blockage points and sags that can cause overflowing toilets and flooded basements in homes and businesses during heavy storms. 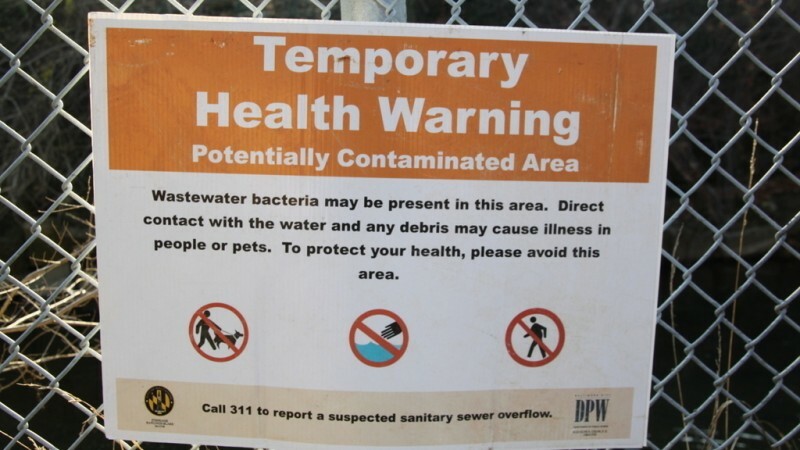 But the intentional “structured” releases of human waste into Herring Run, Gwynns Falls and other streams, as well as the Jones Falls, are in direct violation of the the 1973 Clean Water Act. Baltimore City signed a consent decree in 2002 with the Environmental Protection Agency (EPA) and Maryland Department of the Environment (MDE) to correct the problem through improved engineering. Originally requiring the city to be in compliance by December 31, 2015, the consent decree was extended to 2030 as the city copes with roughly $1 billion of upgrades to its sewer lines and the Back River and Patapsco Wastewater Treatment Plants. The problem of structured sewage overflows is specifically supposed to be fixed by July 1, 2022, according to the revised agreement.